Another crock pot dish has made my life easier this week and is one that will freeze easy for go-to meals when I don’t have time or am not in the mood to cook. 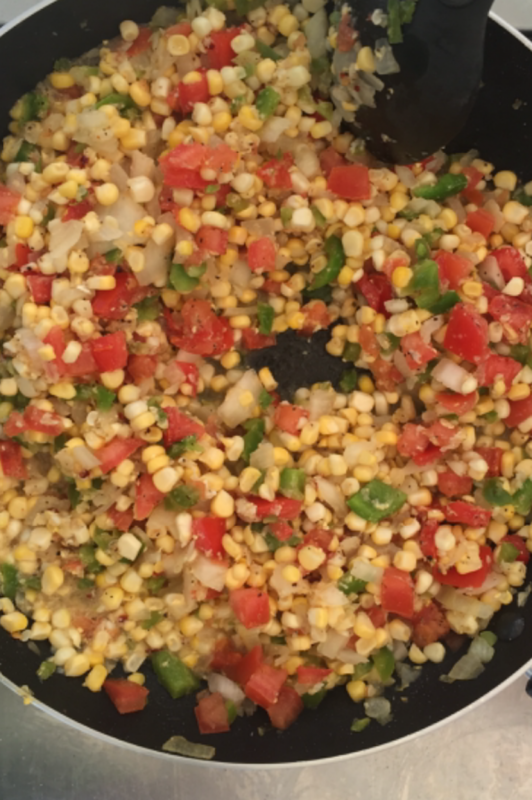 Succotash is an inexpensive go-to dish that is primarily veggie based and a southern favorite; a rich tomato-based fusion of flavor that can slow cook in the crock pot and make it easy to run errands, workout and live life. You can always spice it up with a pinch of cayenne for an added kick. I grew up with this dish made with sausage; however it can be made with or without it. At about $9 for the pot without the sausage, this dish is a must add to the line up. Give it a try and share your thoughts! 1. Shuck and rinse corn, then cut off cob and place in crock pot. 2. Peel onion and garlic; dice onion and mince the garlic and add to the corn. 3. Rinse and slice bell pepper before dicing and adding to the crock pot. 4. Rinse and slice tomatoes. Cut the whole sliced tomato in half (horizontal) then dice for smaller dice. Add to mixture in pot. 5. Slice and add sausage to the pot. Rinse and add Lima beans to the mixture or just add them in if using frozen. 6. Add tomato sauce and fill the emptied can with water twice to add to crock pot. 7. Add tomato paste and seasonings and stir well before setting timer to 4 hours. 8. Cook brown rice 30 minutes before timer is done. If your holiday season was jam packed like mine and full of traditional food and treats, the beginning of 2017 will be all about cleansing and getting back into routine. Growing up in New Orleans, my family always ate black eyed peas and cabbage on New Year’s Day for luck and financial prosperity in the new year. I decided to stick with tradition which is great for both my budget and cleansing with simple foods. Of course cabbage can be cooked a variety of ways, but I kept it simple with the ingredients to keep cabbage as the star. Check out my the recipe below and I wish everyone luck and prosperity in the new year and its adventures. 1. Heat a large pot over medium-high heat and add bacon. Flip after 3-4 minutes and then reduce to medium heat . 2. Peel and dice the onion while bacon cooks. 3. Remove bacon and place on a paper towel and add onion to the bacon drippings in the pot. Stir and add 1/2 cup of water to prevent sticking. 4. Break off darker large leaves if attached, rinse and slice the larger leaves into thirds and stack them before slicing them into strips. Add to pot and stir. 5. Rinse the remaining head of cabbage, cut off rough end and cut in half. Remove the core from each half by slicing in a “v” around the core for easy removal. 6. Cut each half into large chunks, then a large dice like you would an onion. Add to the pot and stir. 7. Chop bacon into large pieces and add to the pot. 8. After 15 minutes, add vinegar, sugar, and seasonings. Stir well and cook for 15-20 minutes. If serving with rice, start rice and set the timer for both.